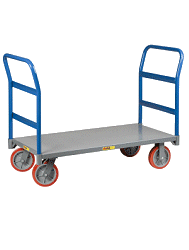 The P-style hand truck is ideal for transporting heavy and awkward loads. Truck works well for the user that needs to free up one hand. The P-shaped handle makes the truck easy to steer and maneuver. Steel construction with powder-coat paint finish for durability.